Santa has announced his hours and house location. 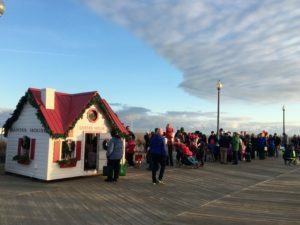 Santa’s House will be on the Rehoboth Boardwalk at the end of Rehoboth Avenue; Stop by and tell Santa your Christmas wish list. Remember to bring your camera! Santa’s House is donation based. Sunday, Dec. 2: 1 – 3 p.m.
Sunday, Dec. 9: 1 – 3 p.m.
Saturday, Dec. 15: 1 – 3 p.m.
Sunday, Dec. 16: 1 – 3 p.m.
*Please note the schedule is subject to change. The Chamber would like to thank the following businesses and individuals for their holiday help to date: City of Rehoboth Beach, Coastal Towing, Murphy Electric, and of course, Mr. Claus. Didn’t get a chance to see Santa? You can always leave a letter to Santa in his mailbox on the side of his house. Have pictures with Santa in Rehoboth Beach that you want to share? Tag the @RehobothDeweyChamber in your Facebook photos.